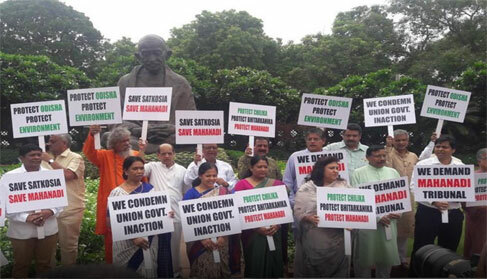 New Delhi: BJD, Congress MPs protest near Gandhi statue on Parliament premises demanding tribunal for settlement of Mahanadi water dispute. 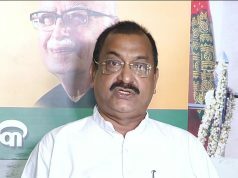 BJD MPs raise Mahanadi issue in Lok Sabha, demand discussion on it; Debate will be held during Zero Hour, says Speaker . 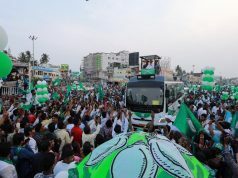 The protest was staged by 20 MPs of BJD and Congress Rajya Sabha MP Ranjib Biswal condemning the inaction of the Union Government in the matter and demanding setting up of a tribunal. 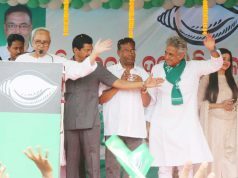 Holding placards during the protest, they also alleged that the Central government and Chhattisgarh government are not paying any heed to the demands of Odisha. The Chhattisgarh government should be immediately directed to stop construction of barrages upstream of Mahanadi, they said. Later, as soon as the House assembled, 11 MPs of BJD created ruckus near the Speaker’s podium demanding discussion over the Mahanadi issue. on Parliament premises over Mahanadi water dispute.